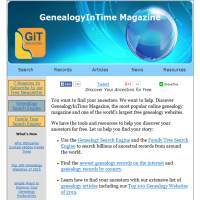 GenealogyInTime offers a variety of free tools to help you in your genealogy research. It helps find information by utilizing information from a range of other websites, and showing you the results. From there you can choose which sites to visit in order to find what you’re looking for. The benefit of Genealogy In Time is that it’s a potential time saver. If you’re looking for a piece of data you simply can’t find on another genealogy website, its search engines will offer up a bounty of possible areas to check. It checks billions of documents from over 1000 genealogy websites, so there’s a lot to explore. Wading through billions of items, with potentially thousands of results, can be a struggle. Although you can tailor your searches somewhat, it feels as though Genealogy In Time needs more filtering options to help you pin down what you’re looking for. The other negative of this system is that you may need to sign up with other sites to access what you’re looking for, and if the information is spread between several websites then you might need to register on them all, which could get expensive. So, this website is a bit like a train station, allowing you to find out where to go, providing links to those places, but not actually providing the information itself. That said, Genealogy in Time does offer free information and tools which are worth looking into. There are over 600 free images to use as you see fit, although they’re quite generic and you almost certainly won’t find anything about your family members in this section. Still, it’s good to have freebies! The site offers some free tools which could come in useful. You can monitor genealogy news and references online with a Twitter gadget and news gadget, or even download their popular Genealogy Toolbar. This toolbar allows you to quickly move between key genealogy search engines, lists new records and provides links to blog feeds, plus other genealogy resources. If you’re new to genealogy then this site could be a bit overwhelming, but at the same time it should prove a useful free resource for your research. If you can get beyond the overload of information and use the free tools properly, you may be in with a better chance of success. To start off, we recommend reading around the site to better understand how it works, as well as reading some of the 80 or so articles that it provides for free. Genealogy In Time is a free resource which could be of great use if you have the patience to use it, whether you’re new to genealogy or a seasoned pro. Webmasters - Link to Us! Web site and all contents © Copyright No1Reviews.com (New Server) 2019, All rights reserved.